Welcome to MotherFunctor®.org - an alternative website for college activists. mǒth’er·fūnc’tǒr: A website that gives birth to a categorical change in exchanging scientific news and comment. In the radical anti-war days of the early 1970's at Berkeley, U.C. 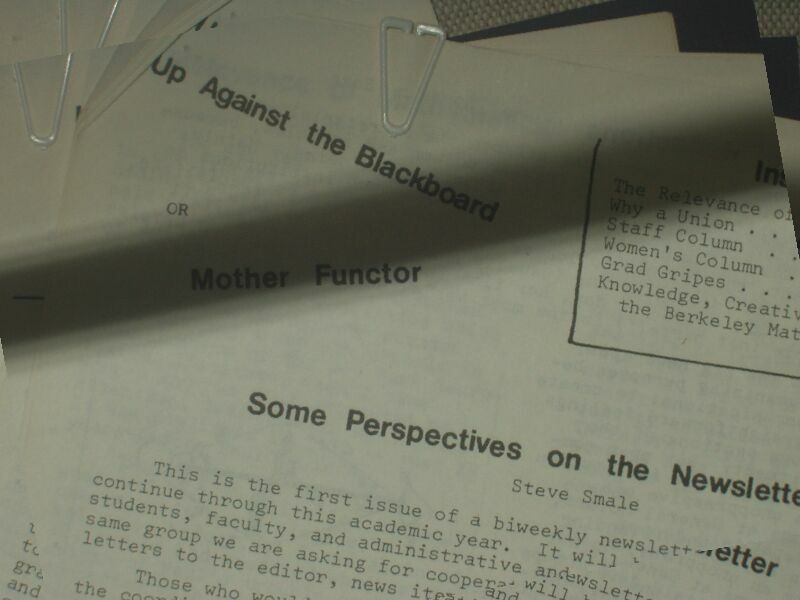 mathematics professor, Fields Medallist and activist, Steve Smale, together with several colleagues, published a short-lived departmental "counter newsletter" of relevant news and comment that "might not otherwise be heard". The MF newsletter, run by volunteer labor, lasted only two years, 1971-1972, and was aimed at organizing scientists to challenge authority. Now, with the unprecedented power of publishing on the Internet outside the constraints of The Establishment, we felt it was time to resurrect the MotherFunctor spirit and "hoist the black flag" - for scientists to work together to improve the system, especially the scientific culture we are leaving to the next generation. The genesis of MotherFunctor.org was the desire to help campus community members (particularly faculty and staff) improve conditions in our colleges and universities. Initially, MF focused on informing our colleagues about the importance and power of Sunshine Laws (Open Records Laws), the individual state versions of the Federal Freedom of Information Act. Documents such as state university budgets, furlough decisions, state audits, travel expenses, and reports of investigations of the university, e.g., by State Attorneys General or State Auditors (see History), which are not subject to FOIA, may often be obtained through Open Records requests. For example, one of the key tools for obtaining the public documents posted on this website was the Georgia Open Records Act. Our continuing goals are: 1) to provide support for the academic community to obtain public university records, and 2) to provide information (e.g. media coverage, laws and judicial decisions) about campus freedom of information, whistle-blowing, and freedom of speech, as well as broader topics concerning ethics and openness in the general college and university community.